While the EU remains the dominant source of potential market moving events, it has plenty of competition. Markets are beginning to understand that there was virtually no meaningful progress, just another series of plans to make plans, without any of the necessary funding or agreement on implementation. See IGNORE ALL RALLIES ON EU CRISIS “SOLUTIONS” UNTIL THREE THINGS CHANGE for a quick summary of why the summit was virtually meaningless, and PRIOR WEEK: 17 REASONS TO FADE THE EU SUMMIT EUPHORIA RALLY for a more detailed explanation. This could and should continue to weigh against any optimism that might sprout up. For further details on how inadequate the current bailout plans are in terms of funding alone (ignoring the equally important lack of agreement on implementation and conditions needed to release such funding even if it were available, see The Half-Life Of The New Euro Bailout Will Be Measured In Weeks by the wonderful Bruce Krasting. Short version: no existing way to get the needed ~ € 2 trillion needed for funding to back up EU banks, not from the EU, US, IMF, or China. Even if all these parties were willing to risk their own solvency to save Spain and Italy, there’s no time to arrange a deal before one of these is likely to become insolvent and bring the end of the EU as we know it. Ways the EFSF and ESM funds could help, assuming that the EFSF has the planned €100 bln available and that the ESM is functioning and funded in time to be of any use. The most optimistic view is early 2013, assuming it survives the political challenges from Germany discussed below. The ESM was supposed to be ratified this week, but votes are being delayed. It faces legal and political obstacles in Germany, and possibly from Finland and Holland too. Easing terms of Greek bailout program, thus far widely denied but also widely understood as needed because Greece can’t realistically meet the current terms. Even if Germany was willing to bend on this, the big remaining problem is how to ease up on Greece while withholding similar treats from the other, more deserving GIIPS nations. Good news or disappointment on any of these could be seriously market moving. On July 10, Germany’s highest court will hear arguments that the ESM violates German sovereignty. If accepted, the court could issue a temporary injunction against the ESM, delaying German participation and possibly ultimately blocking it, which would effectively kill the ESM and all bailouts (like that of the Spanish banks) dependent on it. The threat is very real. Last fall, when examining and upholding the legality of the Greek bailout, the court said that permanent bailout funds, like the ESM, might violate German sovereignty. ESM Has Neither Funds Nor Defined Powers: Even if the ESM somehow survives legal challenges, gets funded, and has a supervisor in place by early 2013 (at earliest)Germany, Finland, and probably Holland oppose the ESM buying sovereign bonds without conditions. There will be conditions, but as yet their undefined, along with their means of enforcement. Spain’s track record of meeting its debt reduction obligations thus far is not encouraging, and it’s missed its budget deficit goals and is flouting demands to correct the situation. The projected €100 bln isn’t enough. Even if that amount could be found given the above obstacles, Spain’s own PM admits in private that the banks need about €500 bln. Most of the buyers for recent Spanish bond sales have been Spanish banks, so if they don’t get funding, Spain’s government will be unable to sell bonds, as no one else will buy them. The Portuguese constitutional court struck down a plan by the government to cut certain public sector benefits. It won’t make a huge impact on Portugal’s deficit cutting to 3 percent of GDP this year. Rather, it suggests the government’s inefficiency and inability to make credible reforms. Finland has said it will block the ESM from buying government bonds to reduce borrowing costs for troubled countries like Spain and Italy. Holland has considered going along with this plan, too. Past sovereign bond purchases by the European Central Bank have been ineffective. While their resistance to the idea makes sense, eliminating this tool will still be seen as bearish. While these nations alone may not have enough clout to block the measure, their opposition undermines confidence in the EU and may even encourage another funding nation to join them. More EU countries seeking help on containing borrowing costs. Cyprus is now seeking aid. This is understandable as she seeks to both preserve funds and prevent other nations already in bailout programs from asking for better terms, but the reality is that Greece will default under current terms. This further undermines market confidence, could keep GIIPS bond yields high. These are unsustainably high, further undermining credibility of GIIPS ability to recover, both in the eyes of markets and funding nations, whose voters increasingly want to be rid of ongoing and further obligations to the GIIPS. This is likely to be a factor early in the week, especially as Asia will have to catch up at the start of the week to reflect the news. Next week kicks off Q2 earnings reporting season. The only big names are Alcoa (AA) and Yum Brands (YUM) Monday, and JP Morgan-Chase (JPM) Friday. Both Alcoa and Yum are a bellwether multinationals, and JPM provides a first measure of the banking sector. After three major central banks eased monetary policy last week, investors will study the latest Federal Reserve policy meeting minutes, for hints about a further round of asset purchases. The recent central bank actions have been viewed as precautionary moves as the global economy stalls. Next week’s GDP data, inflation, manufacturing and other Chinese data will provide the latest important clues about the world’s #2economy. Expectations are low, leaving potential for upside surprises in a market that is looking for excuses to rally. Surprises in either direction could be market moving. Falling revenues from heavy equipment makers despite reckless lending to buyers by many of these manufacturers, which renders these firms even more vulnerable to slowdowns. Thursday: Australian jobs data, Bank of Japan rate statement and press conference, US weekly first time jobless claims. Friday: US PPI, UoM consumer sentiment. For the past seven weeks, most risk assets have traded in a relatively narrow range despite all the drama in the EU. For example, the bellwether S&P 500 index has stayed within the 1260 – 1360 range. A decisive breach of either level will by itself be a significant indicator of the likely trend for the coming weeks. I’ll be on a live podcast Tuesday July 17 on http://www.moneyradio510.com, 12 noon EST. The recording will be available from July 18-24 on the homepage via the archives link, and after that on http://www.thesensibleguidetoforex.com, along with a transcript for those preferring to read it. Just as prudent investors needs to diversify by sector and asset class, so too they must now make sure they avoid the common mistake of having almost everything they own tied to just one or two currencies. With the central banks of the most widely held currencies in full easing mode, they risk debasing the currencies they’re responsible for protecting. They may be helping their economies, but not those who are trying to build savings in these currencies – like those based in US dollars, Euros, British Pounds of Japanese Yen..
One of the biggest lessons of recent years is the need to protect yourself against the risk of crashing markets and currencies dragging you down with them. The best help I can offer you is, THE SENSIBLE GUIDE TO FOREX, SAFER, SMARTER WAYS to SURVIVE and PROSPER from the Start. It’s the first forex book ever published to show how both prudent active traders and long term investors with limited time and risk tolerance can tap forex markets to hedge currency risk and improve returns. See my profile page or the above link for details. 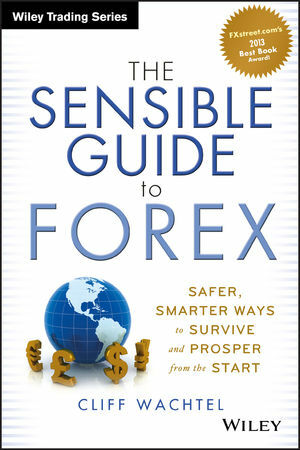 For a complete description of the book visit: http://www.thesensibleguidetoforex.com and go to the About page. For advance reviews, see the Reviews tab.